PRE. 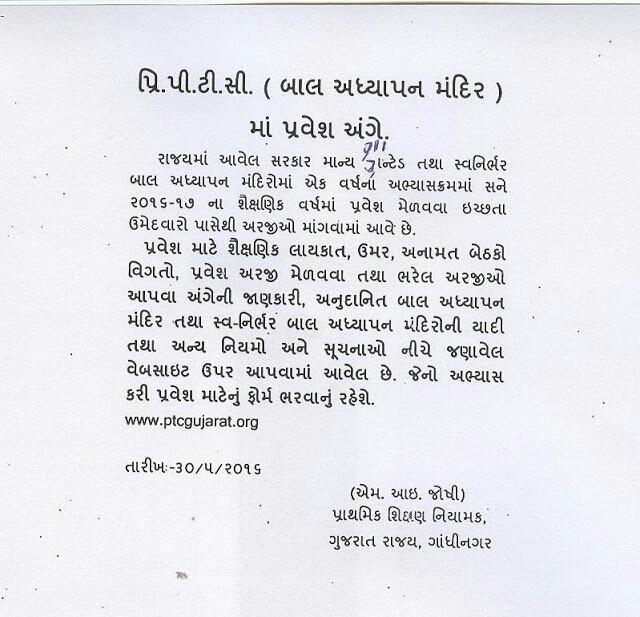 PTC Updates 2016:-Admission Notification for D.EL.ED Pre PTC (Bal Adhyapan Mandir) 2016. Pre P.T.C Me Admission Ki Notification Declared Ho Gyi He.Pre PTC 1 Year Ka Course He.»»»Chack Official Website Click Here.»»»Jyada Jankari Ke Liye Niche Di Hui Image Read Kre. Previous article$avdhan…!Kya Aap 3 Hours Se Jyada Computer Pe Rhte Ho…Must Read. Next articlePravetosav Updates:-Gandhinagar Jille Me 9 To 11 Date Tk 700 Up School Me Pravetosav..!